This blog talks about our experiences buying goods and products from China online shopping sites like AliExpress, Taobao, DHgate. In the course of researching our consumer rights in buying products and items from China, we came across the website of the Ministry of Commerce of the People's Republic of China. In the Ministry's website is an “Inquiry and Answer” link. If you have any trade issue, dispute, complaint, scam, fraud, enquiry, or any matter with China companies that you wish to report on, you can submit an enquiry form to the Ministry of Commerce PRC. After submitting your message, you would receive a message number which you can check back in a couple of days for replies, if any. Whether or not this helps is questionable. There are simply too many companies in China for them to effectively supervise. Nonetheless, if you have an existing matter with a Chinese supplier that is not resolved, you can always consider sending a message to the Ministry of Commerce to seek their advice and guidance. This was the new twist to the saga. In order to claim a shipping refund for the faulty item, we had to Open A Dispute with AliExpress. Once the shipping refund was paid to us, there will be No More Buyer Protection. ETV would only send out a replacement after we agreed to the termination of Buyer Protection. If ETV Technology gave us another faulty replacement, or if the item failed to arrive, we would have No Claim whatsoever. We were of course concerned. We asked Ellen Xi why they told us not to open the dispute in the first place. In our mind, if we had done so, the case would have been resolved much faster. Ellen Xi explained that “it is not good for us that the dispute pending for long time, the store would be closed for high rate dispute pending.” As was obvious, Ellen Xi's only concern was the reputation of ETV Technology. Ellen Xi did not care about the long delay and was not bothered about how customers felt in having to wait months for an item. We were forced to accept the payment of the shipping cost only, and to terminate the AliExpress Buyer Protection even though ETV had not sent out a replacement set. We had no choice. The only assurance was Ellen Xi's words that “if the tv box canot work the online tv after delivery, we would like to bear the shiping cost for you to send it back. and refund the full amount to you via paypal.” As buyers, we were left high and dry. We had been tricked. If we had opened a dispute case when we received the faulty item, we would have claimed a full refund. Instead, after having wasted more than a month, we could only claim a shipping refund, and were left at the mercy of ETV Technology to send a replacement with No Buyer Protection. That was the worst customer experience we ever had with any online seller. 1. the dispute pending is not good for us, but the refunding on aliexpress is only to via dispute. 2. what is more, the shiping cost is also able to be sent to your paypal address. 3. we notice you not to open the dispute earlier, because the package not yet delivery, it is not good for us that the dispute pending for long time, the store would be closed for high rate dispute pending. you might not understand about it. but we would like to explain . 4. for dispute amount, please just fill in the shipping cost of 16.1$. after refunding, we will inform you , and will arrange shipipng of the new original replacement. what is wrong with you , did you misunderstanding we not send you the replacement ? As you wanted, the dispute is now opened. You kept talking about how it was not good for your company for dispute to be pending. In all the messages, you had never considered how a buyer would feel. You wanted us to be kind to you, but are you kind to your buyer? No. You made us go through all the trouble and long wait. We videotaped the packing and return at the Post Office. Yet, you insisted in waiting to receive the package. After receiving it a week ago, you now want us to wait longer for you to process the dispute, and even longer to have the replacement set. We paid for the item more than a month ago, and have nothing todate. What do you mean "what is wrong with me." You refund me the shipping cost and send me the replacement set immediately. If I do not receive it, I will want a full refund of the item cost. Is that wrong? Are you saying you will take another year to send me a replacement? Surely there must be a committed timeline. You kept delaying and giving me all the excuses for not replying to my messages. we will agree with the refunding of the shiping cost, then the new replacement would be shipped out tongiht or tomorrow morning. 2. for return processing time of the package. the package stuck in the customs and the post office not send it in time. it is not in our control. before shiping, we should at least get your agreement before shiping . and the shiping cost should be refunded to you. we just want to refund you the shipping cost from singapore to china, after money refunded, we send you the replacement package. we just wanna refund your shiping cost before new replacement shiping. what is misunderstanding ? it is so simple. As you had stated. Refund me the shipping cost in full now, and send out the replacement unit by tomorrow morning. Please give me the tracking information by tomorrow morning. Do note that if I receive the replacement set and it is still not in working condition, I will have every right to start this process of claim again. You would note that the set you received from me was exactly in the same condition as I had received from you, nothing was missing. I am honest, and I hope you are. it is long term business of us on the aliexpress. dishonest is not our way to sale product. please accept the shiping cost, then we will arrange shiping for you immediately. after shiping company pick it up, we will notice you about the tracking number here. This was the start of another lengthy wait. Ellen Xi dragged the case, taking a week to reply when she said she would do so in 2 hours. The excuses given for the delays and no replies were not supported by facts from the Chinese embassy website. From the internet, it seemed that this was a common strategy by some Chinese companies. There was no need for them to act fast. If they could frustrate buyers enough, perhaps buyers will agree to take a partial refund and forget about the whole matter. Even when the item was physically received by ETV Technology, Ellen Xi took one week to confirm their next course of action. dear friend, please wait a moment, i will confirm it in 2 hours. Hi. You said you would reply in 2 hours. It is now 2 days. Even when you said on Apr 11 that it was Qing Ming, your China embassy website said Qing Ming was on Apr 5. Please do not drag and delay any further. It has been one week. Please reply. It is now almost a week since you received the item. And more than a month since I paid for the item. How long more do you want to drag this? We videotaped the entire process of packing the item for return as well as the transaction at the Post Office. We forwarded to Ellen Xi the YouTube videos and even asked if she required further proof that the item was mailed to them. She refused to reply. ETV Technology would not trust that the item was sent to them until they received and examined it. Only then would they consider sending out a replacement set. This is how it will work. I can send it first thing tomorrow morning and give you the tracking info plus the photos of the receipt and item. Can you immediately send a replacement to me to reach me by next weekend. If you are not satisfied, tell me what proof you need, like us having to videotape the whole process at the postal office? Because to wait for you to receive and then send me would take too long. Please confirm that you will send the replacement immediately upon receipt of the proof I mentioned ie. tracking info, photos or receipt and item. What other proof do you need? We have checked with Aliexpress and the internet users. Your interpretation of the condition for refund is not correct. Under your clause "4 We will bear all the shipping cost if the product(s) is (are) not as advertised." You advertised a working TV box, and it was NOT working when we received it. You should bear all shipping costs. According to other netizens, even if the item is working but buyer has other reasons for wanting to return it, you have stated in clause "1 Shipping cost is bear by both seller and buyer in half." You are wrong to say that you would not bear the shipping cost from Singapore to China. We can ask Aliexpress and internet forums again. The item was sent via normal registered air mail through Singapore Post. Postage paid was $16.10. Tracking reference was RC622845955SG. Please refund me the shipping cost and send me the replacement set immediately without delay. Thanks. “1. You have 7 days to contact us and 30 days to return it from the date it was received. If this item is in your possession more than 7 days, it is considered used and WE WILL NOT ISSUE YOU A REFUND OR REPLACEMENT. There are NO EXCEPTIONS! Shipping cost is bear by both seller and buyer in half. As it turned out, the guarantees by ETV Technology were false and untrue. There was no such thing as bearing shipping cost “in half” or bearing “all the shipping cost” even though the product was not working as they had advertised. If we wanted to return the item and claim a full refund, there will be No Refund of the shipping cost, period. We buyers received a spoilt Android TV Box that could not work. If we could not wait for a replacement and wanted to claim a refund of the monies paid, we had to foot the shipping cost to return the item to ETV Technology. This was not as stated in their seller's guarantees, and as buyers we were left with no recourse if ETV Technology failed to honor their guarantees. 1. How are you going to pay me for the shipping cost? To my credit card? 2. Do I need to get you a receipt from the postal agency? 3. When will you effect the refund? What if you don't? 4. What is your address to be shipped to? 5. Confirm that I will get a FULL REFUND of the purchase price and the return shipping charges? We have Qing Ming in Singapore too, although not a public holiday. However next Friday is a public holiday for Easter. We wanted to have the set in time for next weekend but our plans are now spoilt. At first I did not mind having a replacement. As you can see, by the time you receive it and send me another, it will be a long time more. Hence I would rather have a FULL REFUND so that I can buy another one from another seller tonight. 1. shiping cost refunded for new replacement. not accept for full refunding. 2. after the package delivery, we will refund you the shipping cost via aliexpress. after the shiping refunding, we will send out the new replacement for you. 3. we wouldnot like to do only one transaction business. it is not good at all for the long term business on aliexpress to cheat the money. please mark " ETV " on the package. once the package delilvery, the warehouse worker will inform me. and I will arrange new replacement shiping for you. 5. if you want to send the box back for refunding, we wouldnot bear the shiping cost from singapore to china. Tried as we might to get it to work, the TV Box was faulty. Under the rules of AliExpress, we could open a dispute and make a claim. We informed Ellen Xi, and were told Not to open a dispute. Out of kindness to them, we did not. On hindsight, we regretted listening to Ellen Xi. We should have opened a dispute right away to move things along. Ellen Xi dragged her feet, took a long time to reply, gave excuses that were unsupported by facts, and started to turn rude and nasty as her replies showed. In accordance with Aliexpress' instructions, we will be opening a case. We have exchanged several emails with you since Apr 7. We had written to you within an hour of receiving the item from the postman. We tested it on a TV and a computer monitor. There was no signal detected. The remote control could not work too. We had shown you the 2 YouTube videos. Your technician had advised us to upgrade the firmware. We bought a mini USB cable just for that. We followed the instructions and upgraded. However, when we connected the box to the TV and monitor, the results were the same. 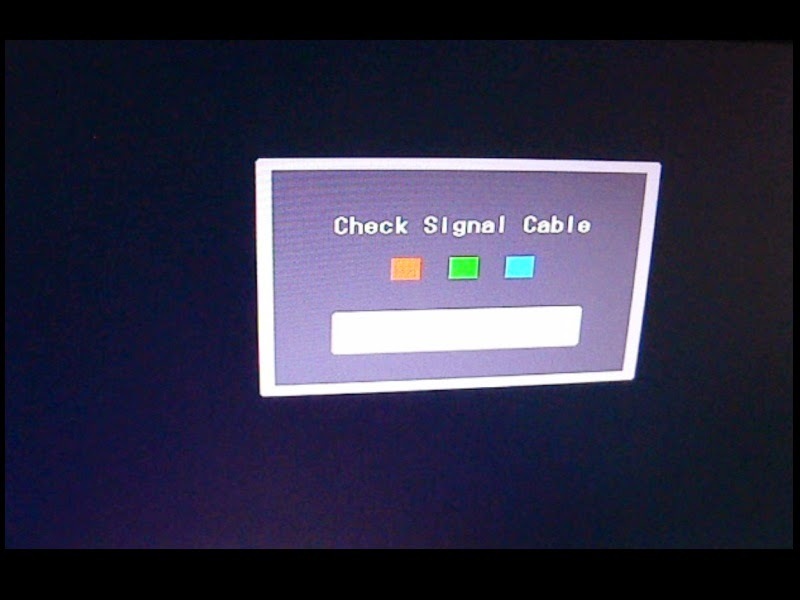 No signal was detected. Like you, we were disappointed after having spent hours attending to that. As explained, we had tried our best to help. It is unfair for us to put in any further time or expense. 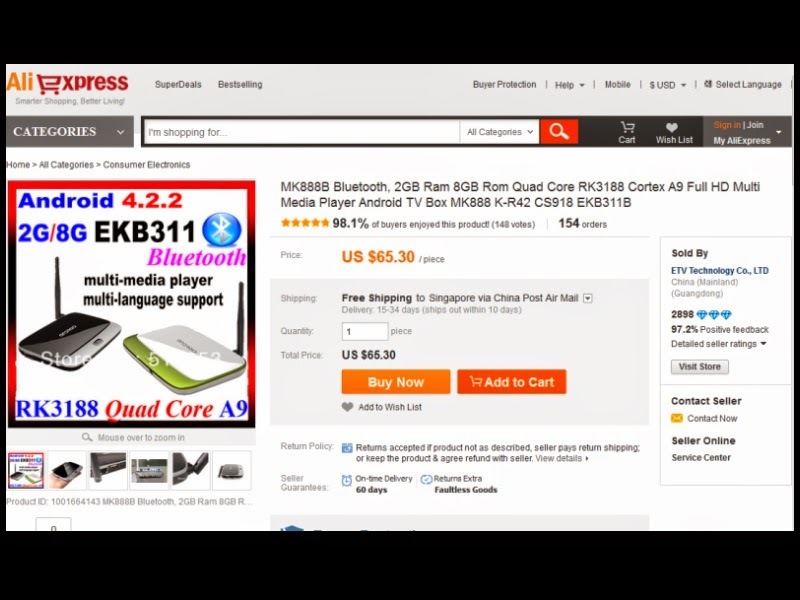 There are many sellers selling such CS918/EKB311B boxes. Yours was certainly not the cheapest. We had bought from you because of your good track record and positive feedbacks from other users. For a long time, my wife and kids had also bought through their Aliexpress accounts various items from other sellers. So far, all the other transactions were smooth. We understand that items do get faulty for whatever reason either at source or during transit. Hope you also understand that we are the innocent party here, paying for an item that can't work upon receipt. please dont open the dispute for us. as the shiping cost for the tv box be sent back from singapore, we would like to bear it for you after the package arriving in China. Hi. Can I clarify how this works? You want us to send item back to you, and how are you going to pay us for the shipping cost? How are we to be assured that you will send a replacement to us? Shouldn't opening the case be the right course of action? 1. I have extent the delivery date for you. it is time enough for you to send it back to china, and receive the second package from china to singapore. there is 66 days for your order protected. if the package canot be delviery in 66 days. you can open the dispute at the end of the date. 2. if the tv box cannot be delivery sucessfully, you can open the dispute in in the 66th day. Yes, I can understand English perfectly. You have not answered my question. How are you going to pay me for the shipping cost? To my credit card? Do I need to get you a receipt from the postal agency? When will you effect the refund? What if you don't? Hope you understand that these are the questions anyone will raise because there is no detail provided by you. Not even your shipping address. Please let me know the details and I will consider. It would take many days before you receive it, unless I send it via FedEx. Since the process is so long, I would want to claim a full refund. If I buy one from another seller today, I could receive it much earlier. the shiping by fedex / dhl will cause the customs problem in china, the customs will stop the package. Hi Ellen. We asked you so many questions and you did not answer them. We will NOT send it unless you confirm the mode of payment of your reimbursement of our shipping cost as well as the FULL REFUND. If we do not get answers, we will be forced to open a dispute case as the last resort. it is QingMing Festival for 3 days. I am not in office today. can you accept to send it back for a new replacement or think about partical refunding ? NOTE: According to the Chinese website, Qing Ming was much earlier, on Apr 5. This was one of ETV's many excuses for not replying to our messages. 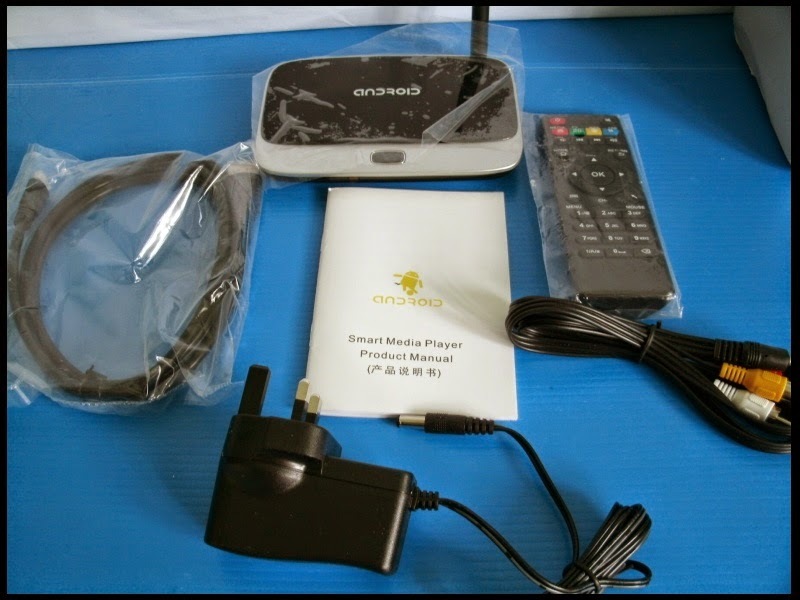 We received the Android TV Box on 7 April 2014 (3 weeks after payment). The set had all the required accessories. We set it up. The Android TV Box could not work! There was No Signal! We connected the HDMI cable to our LED TV and later to our LED Computer Monitor. Both showed the same results. No signals were received from the TV box. Hi. We just received the item an hour ago. When we tested it, we could not get it to work. We inserted new batteries. Pressed and held the power button on the remote. No response. We had to press the button on the console itself. The light turned from red to blue. But no signal on TV. The TV had already been programmed to receive HDMI input. for the turn on / off, please press the on / off button of the tv box directly. the remote controller is not work that. can you test again the device on a computer ? because it shows the power light bluetoot is normal on the device. if not work on another HDMI TV , computer, please let me know. we would like to provide a free replacement for you. even bear the shiping cost from singapore to china. For privacy reasons, the YouTube vids were unlisted, and were not available for public search. We asked people on an online forum for their help and experiences with such TV boxes. The general comment was that even without the remote control, once the set is turned on, there should be at least a main interface on the screen. Would be grateful for any help from you in getting it to work. Hi Ellen. Perhaps you could show your technicians the YouTube vids. If they have any advice on what I can do to get it working, I would truly appreciate it. Sorry to trouble you. We are not experts in such things and can only hope to seek your assistance. Thanks! We were told to upgrade the Android TV Box firmware. For that, we had to buy a mini USB to USB cable since it was not included. A lot of time was taken to download the huge file and meticulously follow their instructions. Hi Ellen. Thanks for the links. The so-called steps only showed how to download. We have downloaded the big 350MB+ file and the other tool. We unzipped them onto a thumb drive. Inserted the thumb drive into the box. Nothing happened. We linked the box to our computer. The big file was just "update.img" and we do not know what to do with it. We ran the tool, and our anti-virus program stopped it for some reason. we have sent the upgarde guide to your email just now, please kindly confirm it. Thanks for your instructions. We went out to buy a miniUSB to USB cable since we did not have one, and it was not provided in the box. However, when we connected the box to the TV and the computer monitor, the results were the same. There was no signal received. You would agree that we have done our very best to help. We noticed that your other buyers did not have such problems, having to do so many things with their new item. Are we the only ones who are made to do all these things? We believe that a replacement would be the next best course. Please advise. We have all heard of the Multi Media Player TV boxes, most popular being those from Android and Apple TV. We bought one on 16 March 2014 for US$68.99 from ETV Technology Co., Ltd (also known as Eny Technology Co., Ltd) through AliExpress, a subsidiary of Alibaba.com. According to AliExpress website, this company based in Guangdong, Shenzhen, China had supposedly sold a number of these sets. Audio Container Support MP1, MP2, MP3, WMA, WAV, OGG, OGA, APE, FLAC, AAC, M4A, 3GPP etc Audio formats.Muliti -EQ mode,Support Synchronized lyrics and full-page lyric display. Image browser Support JPG,JPEG, BMP, GIF, PNG ,JFIF...etc photo format. Maximum resolution up to 8192x8192. Remote Control Support Smart phone remote control 2.4GHZ wireless air mouse/Remote controller.